Surprise! It looks a lot different in here. First of all, welcome to the new site – I really hope you like it! Things look and work a little differently around here, but the focus of Little Green Dot remains the same. At its core, this space is about creating a happy, healthy and green lifestyle and that’s never going to change. However, there’s one area of natural living that I think needs more space, a fresh perspective and a modern voice. I’m really inspired to show you that making your own natural skincare is not only beautiful and worthwhile – but effective and a very real solution to caring for yourself and your family the way you want to. For the last five years I’ve been teaching skincare workshops in-person and online – and I’ve seen first hand the way natural skincare changes a person, inside and out. Just ask my students! If you’re thinking… “Yes! Natural skincare is exactly what I want more of!” then I’m excited you feel it too. Let me show you the new site! On the home page, I’ve collected some of my most popular articles on getting started with natural skincare, from the goodness of whole foods that you can use, to how to bottle your brand new products. I’ve also curated a selection of the most popular natural skincare DIYs from Little Green Dot, so that you can dive straight in and start making. 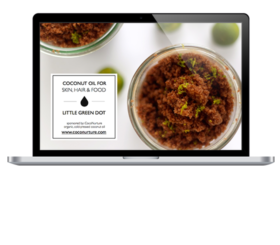 Think of Little Green Dot as your new favorite food blog, but for natural skincare. No hard to find, expensive ingredients. No overly complicated recipes. The only thing I’m interested in sharing are real solutions, for real everyday life. On Little Green Dot, you’ll find ALL the recipes you need to care for your skin’s basic needs, with gentle ingredients and a minimal skincare routine. I’m obsessed with creating the best natural skincare recipes for you, so that you can always come here to find something that is useful and good. Most of what you need to make the skincare recipes on Little Green Dot is already in your kitchen. You won’t need any fancy equipment, but a few good tools do make the job much simpler. I’ve created a page you can find my favorite mixers, blenders and kitchen tools – plus where to buy them. You’ll also find a kitchen pantry guide with all the skincare making essentials that you’ll want to have stocked in your kitchen. Right now you’ll find 15 featured whole food skincare recipes on the website to create something really good for yourself. There are dozens (hundreds?) more to discover as you browse the archives. But for the very best way of staying up to date, sign up for my weekly newsletter and every Tuesday I’ll send you a brand new natural skincare recipe to keep you inspired and glowing! I’m excited for what’s to come. We’re changing the way we talk about skincare and bringing back a sense of enjoyment and simplicity. If you don’t like how the beauty industry makes you feel, watch out, we’re going to kick it to the curb. If compromising between your budget and your values makes you frustrated, get ready to make the change! I’m so excited and inspired by this new focus, and I hope you are too. And if you think Little Green Dot and natural skincare recipes might just be what your friends have been looking for – please share what we’re getting up to by hitting those share buttons below! I’ll be sending you a fresh new recipe each Tuesday, so make sure to sign up to the newsletter so that you don’t miss a thing! Share your thoughts, comments, recipe requests and more in the comments below! Hi Militza, is there a comments feature on all the posts? I wanted to leave a comment on some posts but couldn’t find where to leave them. I’m viewing on iPhone. Thanks! Clean, lean and easy to navigate – Your redesign looks fantastic! I’m so glad to hear that It’s easy to navigate!! Thanks so much for taking the moment to write in and share your thoughts. I really appreciate it! !